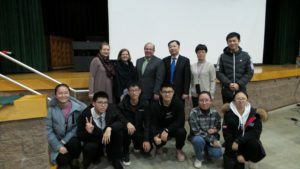 After attending classes at Berlin High School and living with Berlin CSD host families, a group of eight visiting Chinese students have gained new memories and many new friends. The students and their two teachers visited Berlin CSD from February 3 – 10, from Daishan, an island off mainland China. The students immersed themselves in the American way of life by attending classes, practices, games and afterschool activities at Berlin MSHS. During a visit to Berlin Elementary School, students participated in a physical education and music class. The elementary students were very excited to see their visitors. The Chinese exchange students were given an official farewell with special assembly on Friday, February 8th. 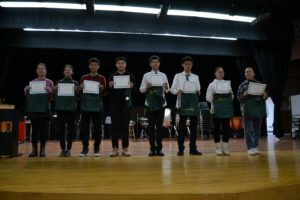 A gift of a traditional Chinese painting was presented to the school, and the exchange students all received honorary Berlin student certificates. The Chinese students bid farewell with a piano solo and group singing performances. The Berlin High School chorus, led by Leslie Eliashuk, showed their appreciation with an uplifting performance of “From Now On,” from the film The Greatest Showman. Thank you to the host families from Berlin Middle/High School who opened their homes to the students and teachers for the week, and thank you to the Director of Exceptional Education, Samantha Brewer who coordinated the visit of exchange students from China.